Award-winning provider of dietary supplement manufacturing services continues its long-standing tradition of giving back to the community & donating both time and money to local charitable organizations. President & CEO of Make-A-Wish Foundation of Suffolk County, Karine Hollander, presents members of Nutricap Labs' management team with a plaque for the firms' summer-long fundraising efforts. Make-A-Wish Foundation® really stands out to me because of the life-changing impact granting these wishes have on their well-deserving Wish Kids and their families, too! 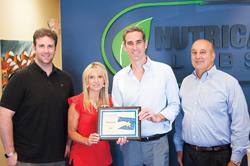 Nutricap Labs, an award-winning provider of turnkey dietary supplement manufacturing services, announced today that it raised $3,490 during its summer-long corporate fundraising campaign. The funds were then immediately donated to the Suffolk County Chapter of Make-A-Wish Foundation® and will be allocated towards granting the wish of a local child who indicated his desire to travel to Disney World early next year with his family. According to its website, the mission of Make-A-Wish Foundation® is to grant the wishes of children with life-threatening conditions to enrich the human experience with hope, strength and joy. Since its foundation in 1980, Make-A-Wish Foundation® has granted more than 220,000 wishes in the United States and its territories – on average, a wish is granted every 38 minutes. In addition to Make-A-Wish®, Nutricap Labs and its employees have supported a multitude of organizations over the years such as Vitamin Angels, The American Red Cross, Habitat for Humanity of Suffolk Country, Island Harvest, Crohn’s and Colitis Foundation of America, and Family Service League. The firm has committed to supporting at least one more charitable cause by the end of 2014. Nutricap Labs is a best-in-class provider of turnkey supplement manufacturing, label design, packaging, and order fulfillment services. We are six-time Inc. 5000 honoree and have received multiple accolades over the years from leading business and entrepreneurial advocates such as The American Business (Stevie) Awards, Best in Biz, and The Golden Bridge Awards. For more information about our services, please visit http://www.NutricapLabs.com or call (800) 494-6154 to speak with one of our friendly and knowledgeable Production Specialists.